Happy Wednesday! It’s time for a new tutorial! 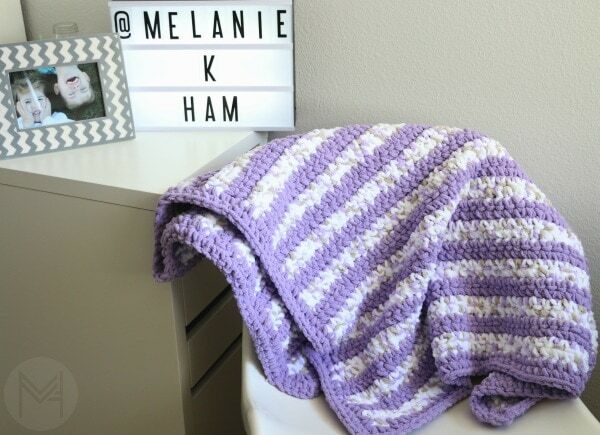 As part of the baby series in which I am making handmade gifts for my bestie who will have her baby probably sometime this month, I have a new crochet stripes baby blanket tutorial for you! 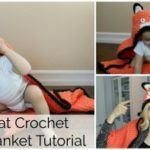 I wanted to make her a crocheted blanket, and since my other crochet baby blanket video is so popular, I figured you would want to see it too! 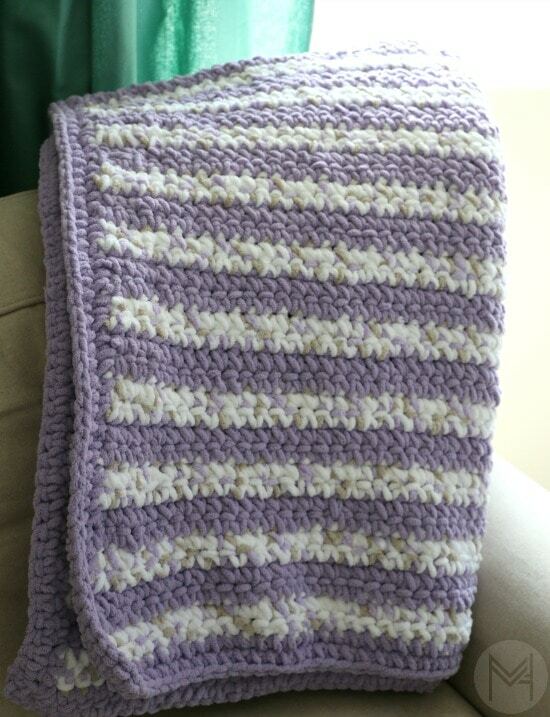 I made this blanket much more dense than the other one and added a border, which I am constantly asked how to do. stitches needed: single crochet (sc) insert hook, yarn over (yo), pull through, yo and pull through the 2 loops on your hook. Pull yarn out from center of the ball. Place sc in the first stitch and continue stitching in every stitch all the way down. Leave 5- 6 inch tail for weaving in the ends. Continue in this manner until you run out of yarn. Add new ball of yarn until you have 21 white rows and 20 purple rows. Weave in all the tails from the color changes before you start on the border. Starting in the corner, sc 3 stitches in the corner of the blanket. Sc all the way around the blanket 2 times. Make sure to put 3 sc stitches in the corners. Along the side of the blanket, place stitches at the bottom and top of each stitch, doing your best. If you have rippling then you have too many stitches. If it’s pulling or has big gaps, you have too few. Fasten off, weave in remaining ends. 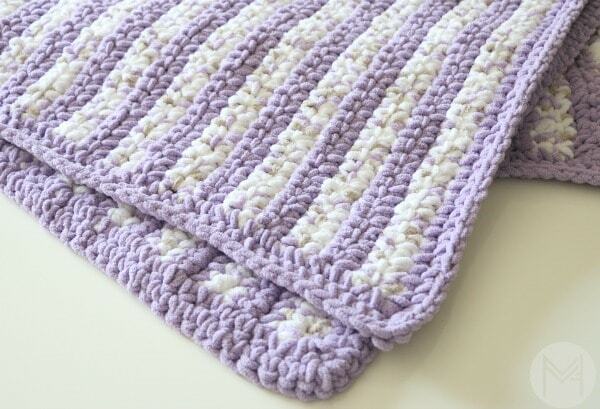 I hope you all enjoy this crochet stripes baby blanket tutorial! Please leave me comments on how its going and post photos to my Facebook Page! Here is the full beginner friendly video tutorial! 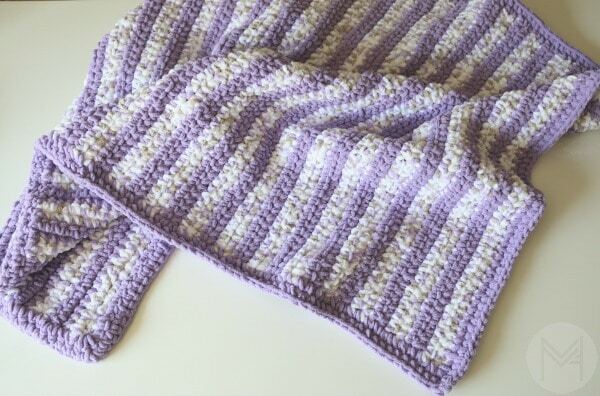 Crochet Baby Blanket with Easy Border! Love the video and it was easy to follow for beginners. I made my first ever baby blanket using your tutorials. I’m sure it’s not perfect but I am very pleased that I did it. Thanks so much Melanie! 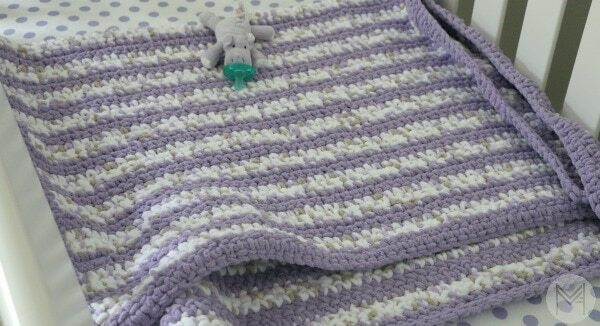 Hi Melanie I’am new to crochet & I’m following your video to make my second baby this blanket & one end of the blanket it is looking like it slants down as I go but my other end is straight it’s the end where I interchange the colors, could you please help. I use to crochet years ago. Your video got me back up to speed quickly. Thank you. ???? I’m a beginner and have been trying to do your blanket but everytime I do, I end up with it tapering towards the middle and not staying even. Do you have any pointers for how to avoid that? 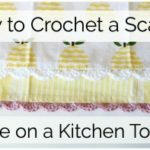 Do you single crochet in the front and back (both) loops? Thanks. Hi there Melanie…Thank you sooooo much for this! 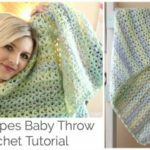 Your tutorial help this beginner make an amazing blanket for a friend who is having a baby boy in 2 weeks! Could not have done this without you! Are these the 3.5 Oz balls of yarn or the bigger ones? Thanks, off to the yarn store! Melanie ~ Thank you so much for the amazing crochet tutorials. 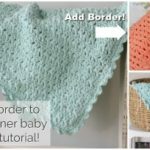 Back in October I learned how to crochet making your super easy peach double crochet baby blanket. I haven’t stopped since and can’t begin to tell how much I enjoy making these and giving them away as gifts. Everyone loves them! 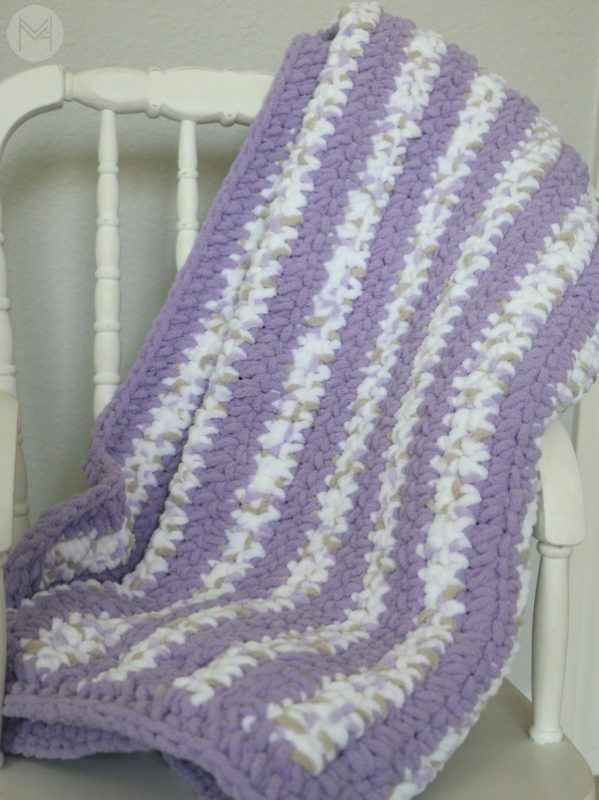 Question: I have yet to make a border on my blankets but would like to try and was wondering what you thought about a single crochet border (like the one in your recent video) on a double crochet blanket? Please let me know. I am anxious to try making your striped blanket as my next project. I did a single crochet blanket with 2 rows of boarder the second row of boarder was a double crochet so I could weave a silk ribbon in it, turned out great!!! Try it you will love the look! Hi! I'm Melanie, and welcome to my little blog! Grab some coffee and browse around for some inspiration! My Source for Sewing Machines! You may not sell my patterns, claim them as your own or distribute the written pattern. Please have any friends or those interested visit the free blog post or purchase their own ad free pdf. You may make individual items to sell (i.e. on Etsy, at craft fairs) from my patterns but please link back to my blog and share pattern credit. You are welcome to share finished items from my patterns on social media, make sure and tag me so that I can cheer you on!